Police later apologized because “a mistake was made,” according to CBS News. 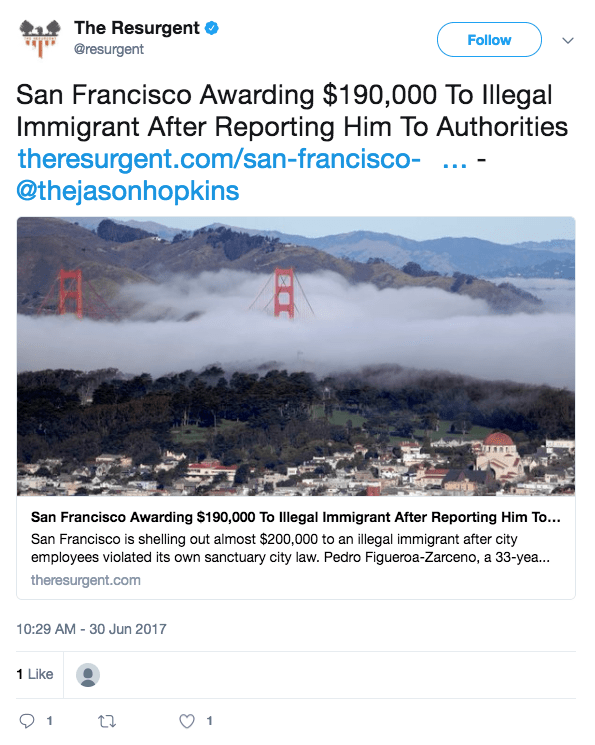 San Francisco is a “sanctuary city.” A sanctuary city is a city that limits its cooperation with the national government where it involves immigration laws. In such cities, federal police can’t always rely on local authorities to uphold immigration laws, as city law prohibits local authorities from cooperating with federal officials unless violent crimes are involved. The law should encourage immigrants to report crimes without fear of being reported and subsequently deported. However, on Thursday, Kate’s Law and the No Sanctuary for Criminals Act were passed in the U.S. House. The laws would enforce harsher punishments on those immigrants who have been deported but come back into the United States (Kate’s Law), and take away federal funding from cities that don’t cooperate with immigration laws. Kate’s Law is named for Kate Steinle, who was shot and killed by an illegal immigrant in San Francisco. Figueroa-Zarceno sued the city of San Francisco this year because it violated the sanctuary city act. Figueroa-Zarceno said he went to the police in December 2015 after getting a call that the department had found his stolen car, according to Fox News. When he showed up, police officers detained him and reported him to Immigration and Customs Enforcement (ICE). Figueroa-Zarceno was taken into custody outside the police station and was in jail for two months, Fox reported. A settlement was reached with the city and the agreement needs to be approved by the city’s Board of Supervisors, according to attorney Saira Hussain, who represents Figueroa-Zerceno, Fox News reported.